What Does Base Rent Mean? If you're renting your home, you probably don't have to worry about "base rent" provisions in your lease. This term relates mostly to businesses, and it's most commonly associated with leases for retail stores in malls. Most of these commercial leases are formulated around some level of base rent. What Does "Base Rent" Mean? The term "base rent" refers to the minimum amount of rent that's due under the terms of a lease. The lease also requires the tenant to pay additional rent based on one or more factors. This add-on is typically a percentage or participation requirement. For example, Karen's Kat Corner, a pet shop, might pay a base rent each month of $1,500. But her lease has a percentage rent requirement that she must also pay on top of the base rent. This is usually a small percent of all sales she makes each month—usually somewhere in the neighborhood of 2 percent—over a certain amount. Your base rent is typically calculated according to the amount of square footage you're renting, and it's sometimes negotiable. It can depend on how high-risk your landlord feels your business is. Are your customers likely to cause damage to community use areas? You may have some negotiating tools at your disposal as well. If you're a dentist, how likely is it that your clients will be using that ice cream stand just outside your door immediately after exiting your office? Additional rent can include not only the percentage requirement but a contribution toward taxes, insurance, and maintenance on the mail property. If this sounds unfair, consider what you're getting in exchange: ample parking for your customers, that food court outside your door, even the security guard at the mall's entrance. How much would these things cost if you had to foot the bill yourself? Under a base rent agreement, you're sharing these costs with other tenants who are also renting retail space in the mall. Incorporating base rent into your business budget can obviously be a tricky proposition. It can help to understand that your rent will never be less than the base rent amount, but you must also make provisions in your budget for that extra percentage. If you're just opening your business, this means forecasting what your likely sales will be. It can be tempting to estimate low, but then you might be hit with a big rent payment if you do much better than anticipated. Weigh your options carefully before entering into such an agreement. 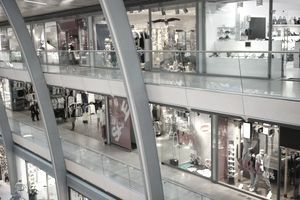 Leasing a stand-alone building for your business might give you the security of knowing you're liable for a set amount of rent each month, but by the same token, you'll lose the advantage of mall traffic. Consult with a professional who can accurately weigh the pros and cons of your business type before you decide. If you're selling earrings and baubles, mall traffic might be worth it. If you're a dentist, probably not.